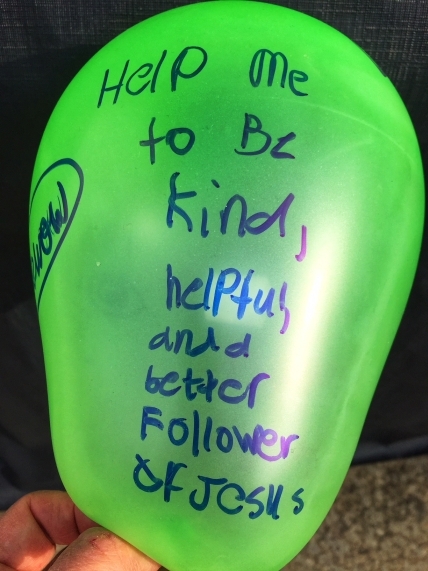 We picked up Joslynn (or rather, intercepted her mid-air) at her church youth group, noting a green balloon with a message on it clutched in her hand. I initially paid little attention to the scribbling on that bulbous bit of latex, because my wife and I were so glad to see Joslynn. She is just plain fun to have around. Plus, she is helping me transition to a new office at Moody Radio. Frankly, she’s become an excellent administrator, conquering cantankerous copy machines, learning to scan documents while numerically sequencing a library of data DVDs for me. Others have observed Joslynn’s work ethic and are asking if she might work for them! At some point during Joslynn’s stay at our house, I took a closer look at the message scribbled on her balloon, which prompted a few questions. ME: So what’s this balloon all about, Joslynn? HER: You’re supposed to look at it and remember what you need to do. ME: And how many kids made balloons with you? HER: Between 100 and 150. Where is that sentiment of Joslynn’s expressed in my life? Is there anything written on that green balloon of hers that people would say is true of me? There’s something very right about a church youth group that would create a project like that message-on-a-balloon. Something very right about parents that would raise a child to think in the ways Joslynn is thinking. May her balloon never burst!